Members	You're not logged in! Step into the relaxed and friendly atmosphere at Lucenz Hair Design. Let our highly skilled stylist help you look fabulous and feel good. Whether you want your favourite style, a new look or a consultation on what suits your face and personality, we are here to make your day and help you step out in confidence. Whether you're looking for a pre-party pick-me-up or a drastic colour change, we are here to help! No matter your taste or budget, we are committed to listening to your needs and desires to offer you creative ideas that will suit your personality and lifestyle. We can help you choose the professional products that will help you maintain your new hair style and prevent any future 'bad hair' days. Imagine... a hairdresser who has been trained to listen to you and guarantees that you leave the salon with not only a new look that suits your face and hair type, but also your lifestyle. Imagine... a hairdresser that will take the time to show you how to blow dry your hair professionally so that you recreate the salon look at home with ease. 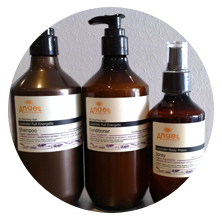 Lucenz uses and recommends AWEPLUS salon management software.